Southwest Michigan's finest Certified Organic apples and award-winning apple cider. 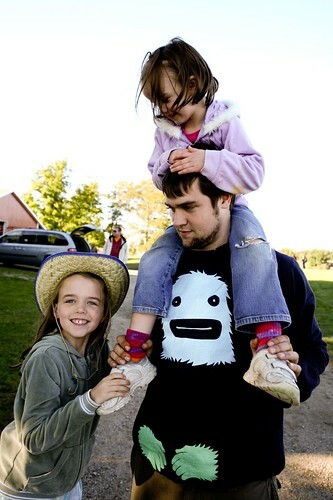 Our 49-acre farm, located in Berrien Center, Michigan, has been owned and operated by the Rosenfeld family since 2005. We started out by transitioning to organic growing, and we have been certified organic since 2006. We look forward to meeting you at a Farm Market stand or out at the farm! 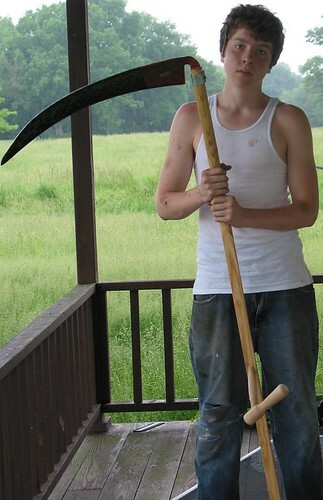 Spencer, ready to take care of the weeds under the apple trees. 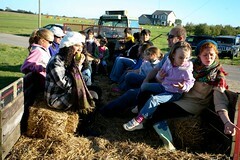 Sydney (on the right), giving rides on the hayrack at the Harvest Party. Ryan, playing tour guide/ride to his cousins at the Harvest Party. Your own organic apple tree. Taste your way through the fall. Looking for a vegetable CSA share to complement your apples this year? Pick up your apple share at the same time as your veggie share when you join this farm!